The Libra male is a perfectly balanced specimen of a man. His is the sign of partnership, of equality, and of justice. He will strive to stay on an even keel, always trying to be objective. A Libran will often seek to do what he thinks is best for everyone. He believes that you can please everyone all of the time, if you study every possible perspective in any situation. He is a pacifist and dislikes conflict. Nothing can be achieved with a temper tantrum and a Libra man will go to any lengths to avoid confrontation. He much prefers peace and quiet. He strives for harmony and balance. He'd rather talk things through and try to understand your side of the story, than slam doors or throw plates. It's hard to be patient with a Libra man at times. Picking a movie to watch, what to eat, and where to meet – these questions may take some time to be answered if you leave it all up to him. Remember that his vacillation isn't an indication of weakness, but his predilection towards impartiality. Take a deep breath and wait for him to come to a conclusion. It will be a firm, fair assessment of all the choices available. The Libra man is the ultimate agony uncle, a neutral judge, and an objective decision maker. He is the perfect friend when you need advice. An Air sign, Libran is an intellectual of sorts and enjoys discussing his ideas with others. Libras are very good debaters, with an innate sense of fairness that leads them to weigh the merits and demerits of every argument. Librans seldom choose sides, content to sit on the fence and play referee instead. You can expect any decision made by a Libra man to be extremely level-handed, with every possible angle considered, and no one person given preference over the other. Libra is ruled by Venus and the Libra man is an ambassador of the Goddess of Love. He is urbane and refined. He has a penchant for beautiful things like jewels, sleek cars, and shiny gadgets. He also likes beautiful people, and the Libra man is in his prime at cocktail parties, the ballet, or the theater. He is suave and charming, and will always know just the right thing to say in any circumstance. The Libra man is a man of aesthetics, with a keen eye for beauty in people, objects, music and words. Love is the ultimate expression of emotion to the Libra man. An incorrigible romantic, he loves being in love. A Libra man in love is someone who has found the secret to perfect harmony. He wears his heart on both his sleeves – just to keep things even – and falls in love very easily. Despite his propensity for fickleness, when a Libra is in love he won't play games. If he says he'll call, he will. Leading you on would just be unfair. In between the sheets, Libra men are generous lovers. A typical Libra man wants to please and be pleased. Love provides Libra men with a double dose of pleasure – in the giving of it, and in the receiving. It is a win-win situation and exactly the sort of outcome the Scales like to engineer. You will find the Libra man eager for seduction, foreplay, and some dirty talk. He is as charming in the bedroom as he is out of it, and he is a sensual and sentimental lover. Expect to find rose petals strewn on the silk bedspread, champagne, and waltzing in the moonlight. A Libra man feels most complete when he is in a relationship and he will work hard to ensure it lasts. He treasures stability and equilibrium with his partner. Impartial and earnest, Librans mean well and would never use their words to hurt or wound on purpose. Don't ask him if your bum looks big in your new jeans though – you will likely receive a thorough analysis of the reasons for saying yes, and why he should tell you no in answer to your question. He is generally considered most compatible with Gemini, Aquarius, Sagittarius, and Leo. See also Sun sign compatibility. However, there is a lot more to compatibility than only the comparison of the Sun signs. For example, how do your Venus signs compare? Find out Venus signs here. Discover Venus sign compatibility here. With a set of scales as his Zodiac symbol, it makes perfect sense that the Libra man needs an equal balance of fairness and order in his world. The Libra man will go to great lengths to avoid conflict and achieve calmness in his life. He is objective, fair, and can always see both sides of every argument. 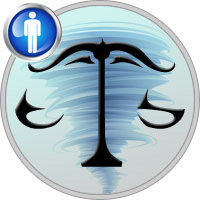 The Libra man struggles with an indecisive nature and his fear of making the wrong decision will sometimes stop him from making any decision at all. Handsome and charming, the Libra man's intriguing stride and striking physical appearance have eyes turning wherever he goes. The Libra man can often be frivolous in his spending and will have a tendency to over-indulge himself on the finer things in life. An expensive purchase may frequently be made out of desire and not necessity. Despite his sometimes impractical tendencies, the Libra man will exercise sound logic and make plans to secure a financial future by mixing short term high-yield investments to his otherwise stable portfolio. Blue and grey represent sophistication so it's not unusual to see these colors on the Libra man. Wearing a suit, it will probably be accented with a lavender tie for harmony. The Libra man is fortunate to have a good eye for fine art and trendy clothing. He enjoys the luxuries of a stylish watch, diamond ring, and gold cufflinks. Although his budget may not always allow it, he does enjoy taking those expensive cars for a test drive. Not being able to afford the meal doesn't stop the Libra man from looking at the menu. If you want a best friend, you'll find a good one in a Libra man. He's sensitive to the needs and feelings of others and will go out of his way to make his friends feel important. Even when he's right, the Libra man will forfeit an argument just to keep the peace. Legitimately optimistic, the Libra man will look past the flaws of a person and see the good in almost every individual he meets. It's easy to understand the popularity of this gentleman. The Libra man is a refined diplomat whose charm and outgoing personality make him a favorite wherever he goes. Attractive and easygoing, this man has no problem finding a date for dinner. If he could travel back in time, the Libra man would imagine himself in a shining coat of armor, his gallant steed carrying him off to save a damsel in distress. Forever the romantic, this Libra gentleman's goal is to please his partner – in every way. He will put his companion's pleasure before his own and this makes him an ideal lover. The one who recognizes the value of his gift will be intimately rewarded many times over. The Libra man generally enjoys fine health, but his active lifestyle may cause him some back problems in later years. Fortunately, the man does maintain good posture and with a little care lifting heavy objects, the Libra man can minimize the risk of back injury. It makes no difference what the Libra man does for work as long as he's not trapped in a tiny cubicle without the contact of fellow workers. The Libra man is an excellent team player and will easily boost the group's morale, but his indecisive nature does not make him the best choice for leader. This man is almost unlimited in his choice of vocations, but would do best as a lawyer, banker, social worker, mediator, landscaper, counselor, or even interior decorator. Whatever he chooses, it's best the Libra man not find himself positioned where immediate decisions are required – such as the New York Stock Exchange floor.